Harrison, Thomas & Elizabeth Irwin (eds.). 2018. Interpreting Herodotus. Oxford University Press. Charles W. Fornara’s Herodotus. An Interpretative Essay (1971) was a landmark publication in the study of Herodotus. It is well known in particular for its main thesis that the Histories should be read against the background of the Atheno-Peloponnesian Wars during which Herodotus wrote. However, it also includes penetrating discussion of other issues: the relative unity of Herodotus’ work; the relationship between Herodotus’ ethnographies and his historical narrative; and the themes and motifs that criss-cross the Histories, how ‘history became moral and Herodotus didactic’. Interpreting Herodotus brings together a team of leading Herodotean scholars to look afresh at the themes of Fornara’s Essay, in the light of the explosion of scholarship on the Histories in the intervening years. What does it mean to talk of the unity of the Histories, or Herodotus’ ‘moral’ purpose? How can we reconstruct the context in which the Histories were written and published? And in what sense might the Histories constitute a ‘warning’ for his own, or for subsequent, generations? Clarke, Katherine . 2018. Shaping the Geography of Empire: Man and Nature in Herodotus’ Histories. Oxford University Press. This is a book about the multiple worlds that Herodotus creates in his narrative. The constructed landscape in Herodotus’ work incorporates his literary representation of the natural world from the broadest scope of continents right down to the location of specific episodes. His ‘charging’ of those settings through mythological associations and spatial parallels adds further depth and resonance. The physical world of the Histories is in turn altered by characters in the narrative whose interactions with the natural world form part of Herodotus’ inquiry, and add another dimension to the meaning given to space, combining notions of landscape as physical reality and as constructed reality. Geographical space is not a neutral backdrop, nor simply to be seen as Herodotus’ ‘creation’, but it is brought to life as a player in the narrative, the interaction with which reinforces the positive or negative characterizations of the protagonists. Analysis of focalization is embedded in this study of Herodotean geography in two ways—firstly, in the configurations of space contributed by different viewpoints on the world; and secondly, in the opinions about human interaction with geographical space which emerge from different narrative voices. The multivocal nature of the narrative complicates whether we can identify a single ‘Herodotean’ world, still less one containing consistent moral judgements. Furthermore, the mutability of fortune renders impossible a static Herodotean world, as successive imperial powers emerge. The exercise of political power, manifested metaphorically and literally through control over the natural world, generates a constantly evolving map of imperial geography. Almagor, Eran. 2018. Plutarch and the Persica. Edinburgh University Press. This book addresses two historical mysteries. The first is the content and character of the fourth century BCE Greek works on the Persian Achaemenid Empire treatises called the Persica. The second is the method of work of the second century CE biographer Plutarch of Chaeronea (CE 45-120) who used these works to compose his biographies, in particular the Life of the Persian king Artaxerxes. By dealing with both issues simultaneously, Almagor proposes a new way of approaching the two entangled problems, and offers a better understanding of both the portrayal of ancient Persia in the lost Persica works and the manner of their reception and adaptation nearly five hundred years later. Intended for both scholars and students of the Achaemenid Empire and Greek imperial literature, this book bridges the two worlds and two important branches of scholarship. The Bibliotheke of Diodoros of Sicily is the most voluminous Greek historiographical text from the pre-Christian era, and contains the only preserved continuous account of Classical Greek history; for many aspects of this history, such as the events in Sicily, the rise of Macedon under Philip II or the history of the Successors, it is our main or only source. It is thus often used as a source by ancient historians, and a great deal of energy has been spent on identifying which sources Diodoros himself used. Interest in Diodoros as an author in his own right, however, is a comparatively recent phenomenon. The contributors to this volume, junior scholars as well as leading international experts, set out to confront the old and new approaches to Diodoros, studying his first century BC context, questions of genre and purpose, his relationship to his predecessors, composition and narrative technique, the role of the gods and myth in the work, the use of speeches, and Diodoros’ interest in themes like war, writing, language and politics. In so doing they offer exciting new insights into the Bibliotheke and the development of Greek historiography, which in turn also shed important new light on the old question of Diodoros’ value as a source. Safaee, Yazdan. 2016-7. Achaemenid Women: Putting the Greek Image to the Test, Talanta 48-49, 101-132. The historians of ancient Greece, as part of the elite of Greek communities, of their own time. By studying the works of these historians one can become familiar with these traditions and the common view on the world in Greek culture regarding various issues and concepts. The purpose of this paper is to study and analyze the Greek approach to women and the effect of this approach on the way the history of the Achaemenid Empire (ca. ((550 – ca. 330 BC) was written. Our central theme in this paper is the question of the connection between the Greek perspective on women and the reliability of narratives related to women in the accounts of Achaemenid history by Greek historians. Lanzillotta, Lautaro Roig with the collaboration of Luisa Lesage (eds.). 2017. Frederick E. Brenk on Plutarch, Religious Thinker and Biographer. Leiden: Brill. The present book Frederick E. Brenk: Plutarch, Religious Thinker and Biographer, “The Religious Spirit of Plutarch of Chaironeia” and “The Life of Mark Antony” includes the updated and revised version of two seminal articles on Plutarch by F. E. Brenk published thirty years ago in ANRW. Edited by Lautaro Roig Lanzillotta, both articles cover the two sides of Plutarch’s corpus, the Livesand Moralia. Frederick Brenk, PhD (1971), University of Kentucky, is Professor Ordinarius Emeritus Pontifical Biblical Institute, Rome. He has published extensively on Plutarch during the last four decades. Lautaro Roig Lanzillotta, Dr. Litt. (1997) and Dr Theologiae (2004), is Associate Professor of New Testament and Early Christianity. Dueck, Daniela (ed.). 2017. The Routledge Companion to Strabo. The Routledge. The Routledge Companion to Strabo explores the works of Strabo of Amasia (c. 64 BCE – c. CE 24), a Greek author writing at the prime of Roman expansion and political empowerment. While his earlier historiographical composition is almost entirely lost, his major opus of the Geography includes an encyclopaedic look at the entire world known at the time: numerous ethnographic, topographic, historical, mythological, botanical, and zoological details, and much more. To see table of contents click here. Waters, Matt. 2017. Ctesias’ Persica and its Near Eastern context (Wisconsin Studies in Classics). University of Wisconsin Press. The Persica is an extensive history of Assyria and Persia written by the Greek historian Ctesias, who served as a doctor to the Persian king Artaxerxes II around 400 BCE. Written for a Greek readership, the Persica influenced the development of both historiographic and literary traditions in Greece. It also, contends Matt Waters, is an essential but often misunderstood source for the history of the Achaemenid Persian Empire. Matt Waters is a professor of classics and ancient history at the University of Wisconsin–Eau Claire. He is the author of Ancient Persia: A Concise History of the Achaemenid Empire, 550–330 BCE and A Survey of Neo-Elamite History. Wiesehöfer, Josef, Horst Brinkhaus & Reinhold Bichler. 2016. 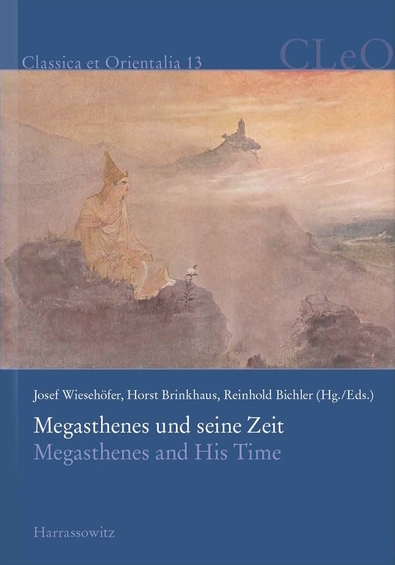 Megasthenes und seine Zeit. Akten der Internationalen Tagung „Megasthenes, Apollodoros and Isidoros. Greek Views of India and the Parthian Empire“. Kiel,27. –30.6. 2 012. . Vol. 1. (Classica et Orientalia 13). Wiesbaden: Harrassowitz Verlag. The volume comprises a collection of the articles, presented initially at the conference “Images of the Orient: Megasthenes, Apollodorus of Artemita and Isidore of Charax”, held from 27.06. until 30.06.2012 at the Institute for Classical Archaeology of the Christian-Albrechts University of Kiel (Germany). The contributions of this volume deal with Megasthenes, the Greek ethnographer and explorer in the Hellenistic period, as a central object of study. He became an ambassador of Seleucus I Nicator of the Seleucid dynasty possibly to Chandragupta Maurya in Pataliputra, India and played an important role on the transition of the Greek notions of India as semi-mythical Wonderland and the geographical remit of great gods and heroes (Semiramis, Hercules, Dionysus, etc.) towards a verifiable plave with native traditions; however without a complete relinquishing the old topical descriptive and explanatory patterns . Megasthenes reports, is among the earliest well-known Western accounts of India. Huby, Pamela, Sten Ebbesen, David Langslow, Donald Russell, Carlos Steel & Malcolm Wilson (eds.). 2016. Priscian: Answers to King Khosroes of Persia (Ancient Commentators on Aristotle 1). London. Bloomsbury Academic. Priscian of Lydia was one of the Athenian philosophers who took refuge in 531 AD with King Khosroes I of Persia, after the Christian Emperor Justinian stopped the teaching of the pagan Neoplatonist school in Athens. This was one of the earliest examples of the sixth-century diffusion of the philosophy of the commentators to other cultures. Tantalisingly, Priscian fully recorded in Greek the answers provided by the Athenian philosophers to the king’s questions on philosophy and science. But these answers survive only in a later Latin translation which understood both the Greek and the subject matter very poorly. Our translators have often had to reconstruct from the Latin what the Greek would have been, in order to recover the original sense. The answers start with subjects close to the Athenians’ hearts: the human soul, on which Priscian was an expert, and sleep and visions. But their interest may have diminished when the king sought their expertise on matters of physical science: the seasons, celestial zones, medical effects of heat and cold, the tides, displacement of the four elements, the effect of regions on living things, why only reptiles are poisonous, and winds. At any rate, in 532 AD, they moved on from the palace, but still under Khosroes’ protection. This is the first translation of the record they left into English or any modern language. This English translation is accompanied by an introduction and comprehensive commentary notes, which clarify and discuss the meaning and implications of the original philosophy. Part of the Ancient Commentators on Aristotle series, the edition makes this philosophical work accessible to a modern readership and includes additional scholarly apparatus such as a bibliography, glossary of translated terms and a subject index.